Vestnik RUDN. International Relations is a leading Russian scientific journal, established in 2001 by Peoples’ Friendship University of Russia (RUDN University), which holds a top position in terms of students body internationalization across the CIS and the BRICS (students represent more than 150 countries of the world). This is a classic journal on international studies with a special emphasis on cooperation with the CIS countries as well as with the Global South (Asia, Africa, Latin America), international educational cooperation and history of international relations. The journal is international in topic coverage, editorial board and pull of authors. 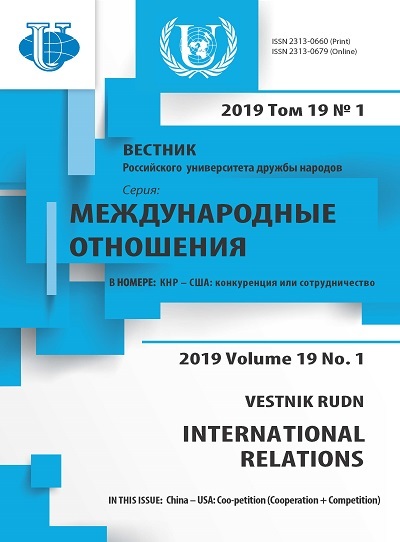 Being included in the international academic discourse, the journal regularly publishes articles of world recognized experts in international and regional studies from Russia, Europe, Asia and the USA. On the other hand, the edition introduces papers by promising researchers from Asia, Africa and Latin America to present their local (national, regional) vision of world that allow to elaborate a balanced approach to facing global challenges. Each of the issues has a particular thematic focus, which is set in advance. Articles on the thematic focus make up the “core” of issue. At the same time other topics are also covered. Constant rubrics include "International Economic Relations", "Peace and Security", "Bilaterial Relations", “History of International Relations”, “Applied Analysis”, “Political Portraits”, “International academic cooperation”. The journal welcomes the publication of book reviews. Academic interviews with leading researchers on international affairs, working in one area, but in different countries are allocated in every issue in the rubric “Research Schools”. Members of the editorial board and leading global experts in corresponding areas of sciences, invited as independent readers, perform peer reviews. Each manuscript is sent for review at least to 3 experts, including 2 external (not from RUDN University).Editor-in-chief, deputy editor-in-chief or science editor choose readers for peer review. We aim to limit the review process to 2-4 weeks, though in some cases the schedule may be adjusted at the reviewer’s request. Each reviewer has the right to refuse to review a manuscript if there is a conflict of interest that could affect the perception and interpretation of the material. Each reviewer fills out a specialized form that allows to impartially and objectively evaluate the paper according to a number of criteria. Among them compliance with the scope of the journal, relevance of the topic and presence of unpublished material. Reviewers evaluate the scientific novelty, methodology, literature relevance, correspondence of the title to the content and style of a manuscript quantitatively (from 0 to 5 points). If there are any comments, the reviewer should explain it in detail, and also give constructive suggestions for correction. If there are abusive statements against the author and personal attacks in the reviews, the editors have the right to moderate the individual comments of the reviewer. At the same time, the reviewer's formalized answers to questions A, B, C (yes / no), as well as an evaluation of D-H criteria (0-5 points) are sent to the author without any changes. The journal is published quarterly. Each of the issues has, but is not limited by a particular thematic focus, which is set in advance (at least 1 year before). Articles on the subject of the issue constitute the "core". At the same time, papers on other topics, in particular on the priority of the journal constant headings are published, which include "History of International Relations", "Applied Analysis", "Political Portraits", "International educational cooperation." The journal welcomes the publication of reviews. In every issue in the category "Research School" academic interviews with leading researchers on international affairs, working in one area, but in different countries are published. This will enable to carry out a comparative analysis of research traditions of IR in different countries. Printed version has 500 copies. «Vestnik RUDN. International Relations» is an open access journal. All articles are made freely available to readers immediately upon publication. Our open access policy is in accordance with the Budapest Open Access Initiative (BOAI) definition - it means that articles have free availability on the public internet, permitting any users to read, download, copy, distribute, print, search, or link to the full texts of these articles, crawl them for indexing, pass them as data to software, or use them for any other lawful purpose, without financial, legal, or technical barriers other than those inseparable from gaining access to the internet itself. For more information please read BOAI statement. Pursuant to the Russian Federation effective law as applicable to compliance with the copyright to electronic information resources, no materials from any site, electronic journal or project may be reproduced, in whole or in part, in any form, either in a hard or soft copy, without a prior consent from the Journal's authors and editorial staff, which may be expressed by posting a respective consent (open license Creative Commons Attribution International 4.0 CC-BY) in the relevant section of the Journal's site on the Internet. The information about all the articles published (article’s full text too) is archived in Russian Electronic Scientific Library (eLIBRARY.ru). The direct URL to the journal issues: http://elibrary.ru/contents.asp?titleid=9658 . You can search through article metadata (title, author, keywords, abstract etc.) on eLIBRARY.ru. The URL to article’s full text is available on the article’s page on eLIBRARY.ru. The articles’ full texts are stored on the journal’s server and can be accessed through this page (http://journals.rudn.ru/international-relations/issue/archive) or from each article's individual page on eLIBRARY.ru.